[Blind Gossip] We’ve talked about this young female celebrity running into serious trouble before and needing help. Although some reports have her in a bad state, she is denying that anything is wrong. According to someone close to her, there’s actually an easy way to tell if she is fine or not. 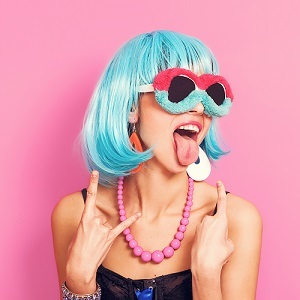 She says,”There is the real me and the me that people talk about on social media.” When she is slipping, she does something drastic to her appearance: more hair, more makeup, piercing, tattoo, big sunglasses so you can’t see her eyes. Sometimes several of those at once. Perhaps she is trying to disassociate from her public persona by wearing a disguise? I would say major depressive disorder and possibly borderline personality disorder. She seems to struggle with self-identity and lacks a sense of self. She doesn’t know who she is and where she belongs in the world. There doesn’t seem to be any genuine love and support with her family. I’m not sure any of them are capable of it. @aaaWayor. Nailed it. I just want to take some of these young women into my country home, far from the rabble, and help them find their true path/self. The girl was raised by Michael Jackson, why would she NOT have psychological issues? Paris doesn’t have a husband so I don’t think it’s her privilege self who would be unknown if ‘daddys’ ama hadn’t bought her fame. I don’t think there’s always a disorder or depression in cases like this.. sometimes bored kids who don’t have to do anything productive to do (or parents to guide them in the real world) can turn out like Paris. I mean her whole life is a lie.. she knows she’s not MJ’s biological daughter, her parents were never married and/or acutally conceived her, she was left behind with her father’s f’d up family who mostly want his money, she has no career/ambition.. all a perfect storm. Paris Jackson…it is only going to get worse. Dysfunction runs deep. I think that she has some issues to work through. Even her ‘fine’ persona seems inconsistent on social media. I think a big reveal about the truth of her mental state, whether it’s medical or drugs or what have you, will be revealed by the end of the year. Sound like Paris Jackson, she needs to clean up, and get involved with helping others. Sure cure for over-indulgence. Paris Jackson. She is in denial, she really does need help. Poor girl, she is drowning in his father b….t. I fell so sorry for her and I wish I can protect her. crazy. The child really never stood much of a chance to be functional and mentally healthy. Hope she gets the help she desperately needs. Paris Jackson or Bella Thorne. Optional: I think she saw some of MJ’s actions with kids and cannot face what she saw, or else heard stuff she shouldn’t have, or heard stuff talked about, or saw his weird books about little boys, etc. She knows stuff but can’t deal with it and so it’s eating away at her. Paris Jackson. She looks like a human scribble. Miley Cyrus? Demi Lovato? Ariana Grande? Paris Jackson. I know she recently got some medical treatments, I’m not going to comment further on that subject. Maybe this is an extension of her being an actor for most of her life, starting at a young age? She can slip into a fantasy world and pretend she is someone else if necessary. Something is very wrong. I feel terrible for this young woman. Paris learned about masks from MJ. Optional: Deflection from MJ documentary. Abuse of many kinds. Poor girl needs separation from that family. I know Paris Jackson is having “personal issues” at the moment but the photo and the disguises being a thing make me think more Amanda Bynes. Optional: If it is Amanda, she’s known to have had psychosis before. If it’s Paris Jackson, I wouldn’t be surprised she’s struggling. This is Paris Jackson. She is dealing with a lot. She is not sure who she can trust – do people deal with her because of who she is? The recent allegations against her father cannot help. She herself said the two people accusing her dad were like older brothers to her, living with the family, etc. Older brother is off in his own world. She is also on drugs – which never helps. She has 1 thing going for her – the boyfriend seems genuine. She’s been assaulted by a family member and she needs professional therapy. But, as so many do, she’ll continue to ride the Druggie train until either she dies, or she just fades into the background…so sad really…. Miley Cirrus. That girl is dumber than a box of rocks. She is clearly a troubled young woman who needs love and attention from someone who does not want to exploit her – like her mother? Or other family that is not the Jacksons.